This entry was posted in Mental Health, Sedative, Success Story on June 8, 2012 by ATMC Team. I’m Jason and for 23 years I’ve been on very strong narcoleptic drugs to control my obsessive-compulsive disorder (O.C.D.) and Tourette’s syndrome. The doctor’s convinced my family and I that I would need to take the drugs for my entire life, this was incredibly discouraging to me. 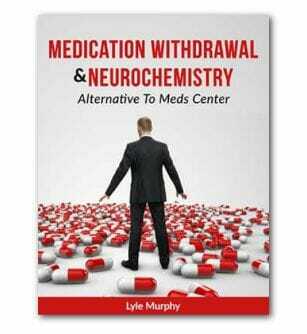 Two months ago, Alternative to Meds Center was introduced into my life. The director, Lyle, was very confident that he would be able to taper me off of my meds safely and implement a holistic, natural regimen. My first thoughts were that he was totally crazy. For 23 years, there hasn’t been one day that I’ve lived without them, and vitamins were supposed to help? At first I thought this was outlandish, but took a very deep breath, went into it and kept an open mind. Every day for my whole life, I have felt like I have to take these medications or else! When growing up amongst friends and my peers it was difficult to feel “normal” because none of the other kids had to take potent sedatives every single morning. And get this, the Vitamins actually did work. I thought this was never possible… ever. My O.C.D. and Tourette’s syndrome symptoms had dissipated and I was also medication free, thank God! One and a half months later, I entered into a different program. After beginning the other program, the program supervisor chose not to allow me to have my vitamin packs. When I stopped taking them, Tourette’s syndrome came back with full force, and my head was literally spinning without control, I was a mess. I brought this to Alternative to Meds Center, and they put me immediately back on my vitamins and once again, the Tourette’s was gone. This is a real miracle, as far as I’m concerned.. For anyone who is plagued with similar situations as I’ve been, I would recommend that they go through this process. It is very effective and really does work.